Stockton State College is a public liberal arts and professional studies institution, located on Jimmie Leeds Road in Galloway Township, New Jersey. It is only a 20 minute drive from Atlantic City. The College was named for Richard Stockton, one of the New Jersey signers of the Declaration of Independence. The college of arts, sciences and professional studies is noted for its exceptional program offerings. Stockton offers bachelor's and master's degree programs, and a doctoral degree program. The Stockton Performing Arts Center hosts theater groups, ballets, symphonies and bands, that are often attended by Atlantic City visitors. Stockton recently purchased the nearby Seaview Resort & Golf Course. They plan to convert a portion of Seaview's hotel rooms into student housing while still maintaining a functioning hotel and golf course. The Seaview purchase also fits in with plans to build a hospitality school, with a hotel and conference center to be operated as part of the college's business programs in hospitality and tourism management. In the spring of 2011, Stockton opened a new 154,000-square-foot campus center. The center is a "one-stop shopping center" for students, containing the registrar's and bursar's offices, advisers' offices, a food court, lounges and meeting rooms. The center includes a 250 seat theater, suitable for small intimate theatrical performances. In 2013 Stckton opened a new 65,ooo sq.ft. Science Center. Stockton claims to graduate the highest number of math and science majors in the NJ state college system. 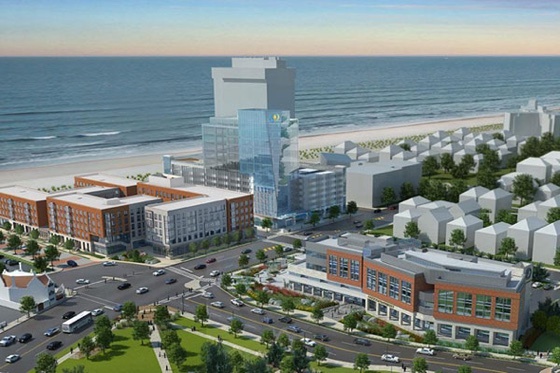 There, at the intersection of Atlantic, Albany, and Pacific Avenues, Stockton plans to finally create its long-discussed Atlantic City campus by putting up three buildings: a housing and student center on the Boardwalk for 500 or so students, a parking garage with 850 spaces topped by new offices for South Jersey Gas, and an academic building for up to 1,800 students. Directions ot Stockton College via Google Map.